Trade has a serious image problem, one that was painfully obvious even before the UK’s Brexit vote and surprise outcome of the US presidential elections. “Free trade and globalization have protected hundreds of millions of people from poverty and hunger. The problem is that few people believe this,” said Donald Tusk, European Council president, to The New York Times. That’s why big trade deals like the Trans-Pacific Partnership are enormously unpopular even before their contents become public, or indeed before the terms are fully negotiated. It’s also why, in the words of the Economist, trade pacts are “the walking dead of diplomacy”. From both a practical and political standpoint, the focus on grand trade bargains is misplaced. It ignores the fact that we already have the tools we need to revive trade-led growth by cutting the cost of moving goods across borders. “The real untapped potential for further trade growth lies in regulation,” says Joakim Reiter, Deputy Secretary-General of the United Nations Conference on Trade and Development (UNCTAD). 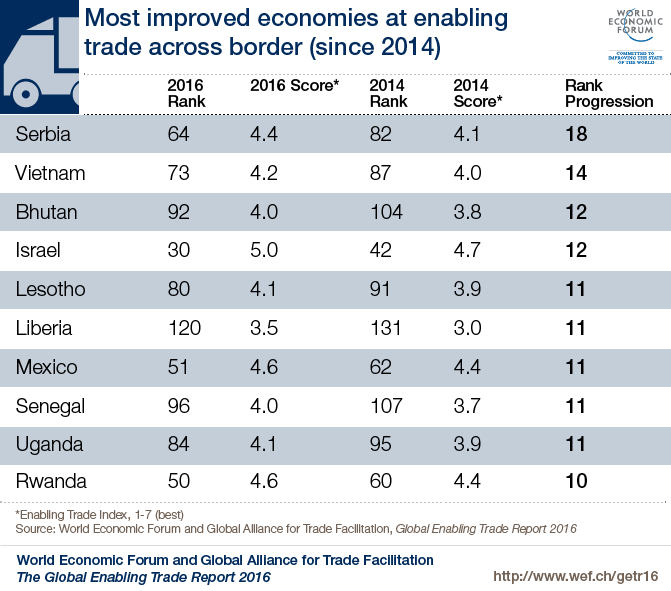 Yet, as outlined by the Global Enabling Trade Report 2016, published this week by the Global Alliance for Trade Facilitation and the World Economic Forum, improvements in border administration over the past two years have been on average extremely small – practically non-existent. Most of the regulations that add to the cost of trade are non-tariff measures (NTMs), which run the gamut from labelling, inspections, licensing and certifications to measures squarely aimed at protecting domestic producers, such as quotas, local-content rules and government procurement regulations. UNCTAD estimates that costly NTMs now affect 96% of world trade. In fact, the world’s 48 poorest countries spend about $23 billion a year on compliance with G20-country NTM costs, according to UNCTAD Secretary-General Mukhisa Kituyi. Kituyi recalls the damaging impact of European Union traceability requirements on Kenyan exports of fresh flowers and vegetables when he was Kenya’s trade minister. The EU regulations were “a nightmare” for the small, mainly women-owned producers exporting to Europe, he said. Tariffs, historically the biggest obstacle to the flow of goods, are at an all-time low, so there is little to be gained in negotiations aimed at lowering them further. But regulations continue to proliferate. And costs? They are not so low. For proof, just look at the World Bank’s Doing Business website. The site shows, by country, how long it takes and how much it costs to fill out documentation, undergo inspections and move goods across the border to a warehouse. In too many countries, the costs and wait times are unacceptably high. If you want to send a shipment to the Democratic Republic of Congo, you will spend 804 hours (33 ½ days) on paperwork, inspections and waits for approvals. Your cost will be $3,900 – not including tariffs and transportation. That same process takes a day or less in Austria, where your cost to comply with documentation and inspections will be about $1. Two years ago, the member countries of the World Trade Organization agreed to streamline trade bureaucracy in order to lower costs. Common-sense changes – automating manual processes, creating “single window” documentation and making regulations transparent and consistent from country to country – could cut trade costs by 13-15% and boost global GDP by $1 trillion a year, the WTO estimated. Sadly, adoption of these changes has been glacial at best. Today, our view of the supply chain is clearer than it has ever been, allowing us to run leaner and be more efficient. We have dramatically shortened the time from order to production and shipment. That, in turn, has freed up working capital, saved on storage, increased productivity and improved customer satisfaction. Where we are not lean or efficient is at the border. And it’s getting worse. Twenty-four of the 50 countries in the upcoming Agility Emerging Markets Logistics Index experienced a year-over-year erosion in their overall competitiveness, a measure that includes their trade infrastructure and business climate. The index, to be published in January 2017, shows conditions worsening in seven of the world’s top 10 emerging markets: China, Saudi Arabia, India, Brazil, Malaysia, Russia and Chile. Yes, trade could benefit from an image makeover. In a single generation, the integration of markets and free flow of goods, investment and people have lifted half of the world’s extreme poor from abject poverty. At a time when the world is desperate for growth, stagnation and retreat on trade are not options. And yes, efforts at new global or regional pacts require a re-think. Any new deal will have to strengthen environmental safeguards and provide skills training that will help dislocated workers move into new jobs. Any new pact will also have to be adapted for the age of e-commerce and the wave of innovation we confront with the arrival of artificial intelligence, automation, additive manufacturing and big data. Finally, when it comes to selling a sceptical public on trade, we should remember that there is a pervasive view that trade agreements are the “dark” work of big business and the WTO. The first step in correcting this misconception would be to refer to trade agreements as “trade-simplification and opportunity-creation agreements". Step two would be to designate the world’s small and medium-size businesses as the torch bearers for these deals. SMEs have the most to gain from trade pacts, and if there is a chorus of support from them, public support will follow. In the meantime, let’s not lose sight of what we can do right now to cut the cost of trade. If we really want to jump-start growth and give developing countries a fair shot, we’ve got to look at the oceans of fine print that are drowning businesses around the world. This includes the overnight, no-notice rule changes in Niger, a nation that lacks a customs website; the number of document copies and approvals required in India; the clearance times and fees in Brazil; and the lack of input from business when rules change in Belarus. If we want to spark growth now – risking none of the political backlash that comes with a big new trade deal – we need to address the back-up at the border.